Pizza Feminism sounds like the title of Liz Lemon’s senior thesis, so it’s only appropriate that this cheesy paean to the rights of women begins with Liz shotgunning a pizza, superimposed with a quote from noted second-wave theorist Catharine MacKinnon. 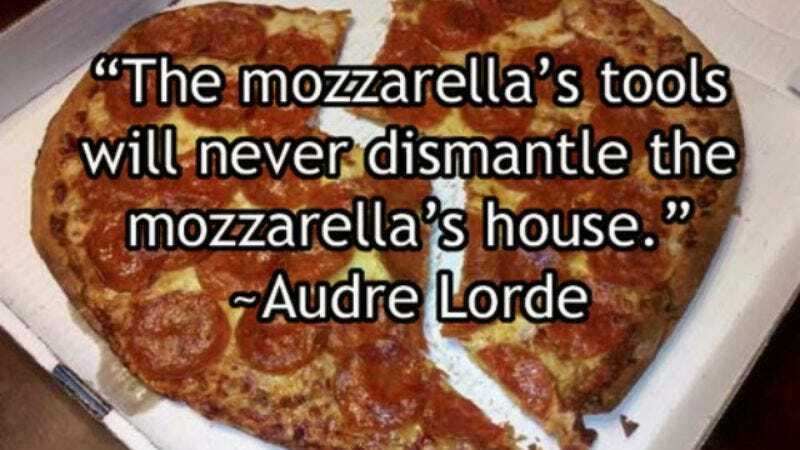 The idea behind Pizza Feminism, subtitled “A Slice Of Feminist Fun,” is to take key words (like “power” and “gender”) from quotes by feminist icons ranging from bell hooks to Janelle Monae and replace them with the universally palatable “pizza.” Pictures of (mostly) gourmet pies complete the effect. They also take submissions, so you can finally put that double major in culinary arts and gender theory to work. Who says feminists don’t have a sense of pizza?